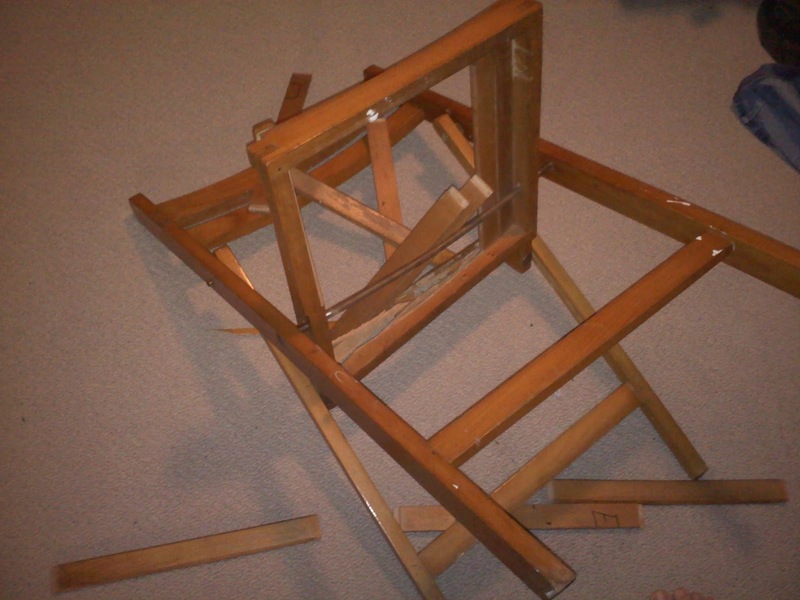 There are few things in life more embarrassing than having a chair crumble beneath you. It is also quite alarming and is not recommended for the young, elderly, or pregnant. Thankfully, I came out unscathed, although my pride fell down like a dead sack of potatoes. I was simply sitting peacefully at my computer typing out a new post for my blog* when suddenly--and foolishly--I was on the floor. After a moment of shock, I checked to make sure I didn't perform what is known in lesser circles as a Self-Shiv, and, having come up clean, stood up to survey exactly what happened. After what I shall refer to as The Incident occurred, I immediately set to work. Countless lives have been lost and tears have been shed once the scene of an accident has been compromised, as unanswered questions and unsolvable mysteries lay forever in file cabinets held by those in charge of retaining our most embarrasing moments in our lives in perpetuity. ** And so I got my CSI kit ready and started taking down the appropriate relevant information. I deliberately choose to ignore Exhibit 1, which is the fact that I am fat, because that clearly isn't the reason. I felt a little better when I realized two things: one, the chair is quite old and was worn before I was in possession of it, and, second, I found a small mechanical bit that I am assuming is called the Small Metal Thing That Holds Everything Else In Place So People Sitting In The Chair Don't Embarrassingly Crumble Like A Sack Of Dead Potatoes had clearly been worn from decades of use. So it all (sort of) makes sense, though I would perhaps prefer a small fire-alarm style chirp to warn me of an impending collapse rather than the actual impending collapse itself to let me know it was time to start replacing the parts. However, there is still one mystery to solve. When the mailman tiptoes to the door and discretely slides a Netflix envelope through your mailbox every single day, our dogs bark madly like Fat Boy is about to touch down. And yet when I rocketed to the ground causing a house-trembling thump that is sure to raise my homeowner's insurance premium if he ever reads this--I got not one peep, not one suspicious squeak. I suspect some sort of Tom and Jerry-style sabotage in the works. My crooked finger of accusation points directly at them. *This is a blatant lie. I haven't written lately because I can't think of anything to write about. **You know full well such an organization exists. I just had flashbacks of a similar incident of my own. Except that incident involved a chair of the white wicker persuasion. Pachelbel's Canon is going through my head now for some reason.